Online bingo is hugely popular – as are online casinos and poker rooms. It is perfectly possible to play without racking up huge debts, and the online environment means we can play from the comfort of our own home – because it’s raining outside, or because we don’t want to, can’t get around as much as we used to, or simply because it’s quick and easy. The online experience is surprisingly similar to the real thing – you can meet and mingle with friends, you can play or watch and in many cases, you even get sound effects (the caller’s voice, the rounds of applause when someone makes Bingo). According to 123 Online Bingo, there is a generally older trend in online bingo, which means you’re more likely to meet up with people who have similar interests and reasons for being there. This may not be true of other online gambling halls such as poker, which is frequented by an – on average anyway – younger audience. There are as many online bingo sites as there are tastes and types of the game – from the slick casino style of Paddy Power (which offers a range of 75 ball, 90 ball and custom bingo variants suitable for quick or all-evening play) to the more traditional feel of Foxy Bingo. The latter uses a an old-style casino type host to offer extra prizes including Jubilee picnic hampers and HD television sets. Bingo isn’t the only game in town of course. Online bingo halls tend to be one arm of a more involved online casino – and you’ll find some big names popping up to sponsor the best, a sure indication both of the popularity and quality of the fare on offer. An example, Sky TV has developed its own online casino, Sky Vegas, which like many online casinos offers a free amount of money to play with for your first visit. In most cases the free money you qualify for is a small amount, £10 or £20 – enough to have fun with and get a feel for the various games on offer. Plenty of online casinos entice their users in with big welcome bonuses, calculated in percentages rather than in absolute monetary terms – so Sun Bingo, for example, is currently offering a 100% joining bonus, which supercharges the initial deposit you make in your account to a maximum amount of £100. Most quality online casinos require that you register with details including email address; your name and address; and your date of birth. At some stage you will also be required to enter credit or debit card information, though there may be some sites that only ask you for credit or debit card information when you wish to buy credit. 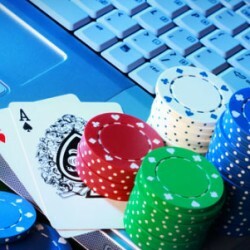 It is, therefore, recommended that you play only with larger, recognised online casinos. Online bingo can be a fun, gentle way to meet other seniors with common interests. When the skies turn grey and the rain comes down, what better way to spend an afternoon?